American Red Cross Greater New York Blog: Brooklyn, Are You Prepared? On Tuesday, Sept. 16, Brooklyn Disaster Program Manager (DPM) Edmund A. Torraca and Disaster Action Team (DAT) Captain Garfield Richards supported an Emergency Preparedness Forum at Brooklyn Borough Hall. 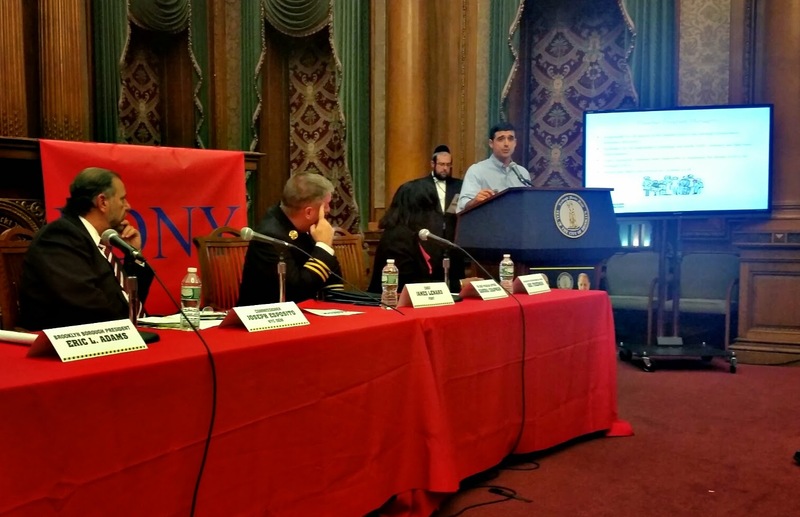 The forum, “Brooklyn, Are You Prepared?”, was an event associated with the New York City Office of Emergency Management’s (OEM) campaign to encourage New Yorkers to be ready for all types of emergencies. "The Red Cross is actively engaging community- and faith-based organizations across Brooklyn to facilitate the development of disaster plans, to bridge gaps in disaster response activities, and to organize efforts to prepare communities to face the challenges of the next disaster,” Torraca said. The forum was hosted by Brooklyn Borough President Eric L. Adams and featured special guest speaker OEM Commissioner Joseph Esposito. Invited guests from FEMA, NYPD, FDNY and National Grid joined the Red Cross to encourage members of the community to develop a disaster plan, gather emergency supplies, and finally, to learn how to keep informed about the hazards faced in New York City. “Brooklyn, Are You Prepared?” afforded the Greater NY Red Cross an opportunity to engage local community leaders, collaborate with preparedness partners, and present disaster response initiatives and long-term objectives.